–There were no changes to the alignment shown this week. The yellow-clad group was still a four-player consortium including Kyle Clifford, Michael Amadio, Jaret Anderson-Dolan and Nate Thompson. We’ll get a better sense of which players may sit versus Detroit at Sunday’s morning skate. –The Red Wings are down a pair of veteran defensemen in Niklas Kronwall and Jonathan Ericsson. They averaged 18:31 and 19:19 in ice time last year. –There’s no silver lining with Dustin Brown’s broken finger. His absence, along with Jonny Brodzinski’s, adds some imbalance to the projected forward group. But in Brown’s absence, Alex Iafallo was reunited with Anze Kopitar and seemed to be right back in midseason form, digging loose pucks free, playing with excellent pace and fluidly using his deception along the perimeter in the offensive zone to create space and work the puck to his teammates. He earned the secondary assist on Anze Kopitar’s goal with some excellent touches deep in the offensive zone. At ice level, what did it appear he was doing well? “Everything, really,” said Kopitar, who shared a scouting report on one of the team’s best forwards in the season opener. It was a good sign that – like last year – Iafallo was again right at home alongside two accomplished and tenured forwards. 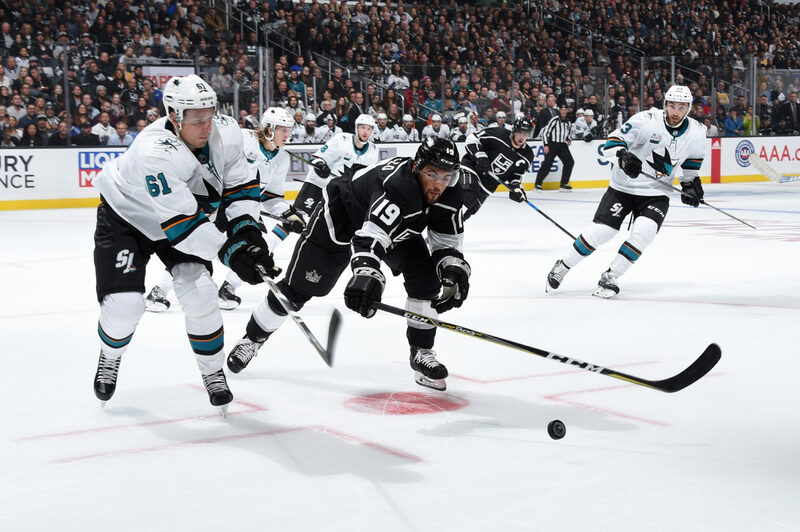 –Adrian Kempe etched out a solid performance Friday, even if it didn’t end his goal drought. He had great looks in the second period, following up a first period in which he used his speed to get in on the forecheck and play heavy in pursuit of the puck. Kempe is being encouraged to use his deceptive shot and ability to shoot off the rush as a player with a pretty good degree of skill and offensive awareness. These attributes were visible during a second period shift in which he was rebuffed by Martin Jones on a good look from the left circle, and after regaining entry to the zone, used his skating ability to move from the right wing into the high slot before dishing the puck to the left circle to Trevor Lewis, whose shot forced Jones into a difficult save. –The power play appeared to be a work in progress during the preseason, posting a 1-for-17 mark in non-split-squad games. That’s not a particularly telling stat, given that the Kings were breaking in a key weapon in Ilya Kovalchuk and weren’t always dressing veteran-heavy lineups. But losing Brown, who ranked second among team forwards with 15 power play points last season, doesn’t help, and Stevens didn’t like some of the things he saw in the opener, starting with the advancement up-ice after losing the offensive zone set-up.